The Beautiful and the Damned is a collection of five essays by Siddhartha Deb which lifts the lid on aspects of Indian life that are outside the experience and exposure of most outsiders who visit the country. In some respects, Deb himself is an outsider, coming from the far north east of the country in Shillong, an area that looks like it should belong to some other country, squeezed as it is between Bhutan, Bangladesh, Burma and China. His family were East Bengalis, fleeing from the new land of East Pakistan (later Bangladesh) into an area where they didn’t fit amongst the locals. It’s a fascinating background to which he offers us only the occasional glimpse because this is not Deb’s story; it’s the story of ordinary and extraordinary people living in the world’s biggest Democracy in the new Millennium. People for whom the economic boom is making either an enormous or a negligible difference to their lives – all depending on where they stand on the economic ladder. For an India-phile like myself, it’s compulsive reading. The coverage of topics is impressive and runs the range of success, aspiration, exploitation and disappointment. The book kicks off with Deb’s determination to understand a young, wealthy and successful management guru called Arindham Chaudhuri who runs a training academy that promises much but mostly seems to deliver jobs within its own organisation. On one hand Deb’s looking for the fraud behind Chaudhuri’s claims but on the other, finds himself getting sucked into the dreams of the students and the fantasies of the family providing the means for those students to build their new lives. This first chapter takes the title ‘The Great Gatsby’, perhaps continuing his original F.Scott Fitzgerald theme which runs through the title ‘The Beautiful and the Damned’. I’d love to make some clever comments but I’ve not read enough Fitzgerald to know if he’s pulling off a very clever analogy or just pinching some good titles. The second chapter addresses the role of engineers in the new India, examining the rise of the high-status engineer, the emigration to the west where they struggle to adapt and the subsequent return of (mostly) young men who couldn’t quite fit in in the USA but can’t live comfortably in their old homelands either. Focussing on the corridor between Hyderabad and Bangalore with its Special Economic Zones, Deb hunts down some fine examples of the modern engineer and his problems. There’s the returnee and his new house in a gated communities of identikit American-style housing estates, insulating him from a world where he no longer fits. There’s a bizarre interview with a nano-poet who proudly claims to have created the art of nanopoetry, writing ‘poems’ in binary on the microchips he designs. Crazy weird stuff. Chapter three takes us into the countryside and focuses on a scandal regarding the growth of red sorghum, a crop that’s fed to cattle and chickens, not people. The scandal is well documented in the press and other books and revolved round a seed dealer encouraging the local farmers to grow this crop and then being unable to pay the promised price for the crop after other seed traders drove the price down and his bank withdrew his credit. Riots followed, farmers killed themselves, properties were burned to the ground. It’s a fascinating examination of how tough it is to be a small farmer and how easy it is for everything to go badly wrong. Banks let the dealer down, he let down the farmers and all hell broke lose. All over a crop the farmers couldn’t even feed to their families. Deb interviews people affected throughout the supply chain, not only looking at the red sorghum crisis in isolation, but also examining the poisoning of water supplies and the destruction of good land. It’s dangerous stuff and at times readers will wonder if Deb has any sense of self-protection. Chapter four examines ‘the permanent world of temporary workers’ looking particularly at the hard lives of migrant workers within India, people who’ve travelled a long way from their home states in search of work and money. He meets men destroying their health to work in steel foundries, taking as much money as they can until their bodies give up. He meets an educated middle-class man walking across the countryside going door to door at factories, looking for a chance to scrape a living. The man reminds Deb of the words of the Nobel Prize winning author Amartya Sen who said that famine doesn’t happen through lack of food – it happens because “the powerful take food from the powerless” and asks him to put that in the book (which of course he does). Deb tells us that 77% of the population of India live on less than 20 rupees (about 30p) per day whilst the number of millionaires and billionaires grows year after year. The economic miracle of the Indian economy is not for everyone. The final chapter is called “The Girl from F&B” and focuses on interviews Deb had with a girl called Esther who works in ‘F&B’ – the trade shorthand for ‘food and beverage’. On the surface Esther is a young successful woman, working in the top hotels and the trendiest restaurants, but the gloss is only superficial. She and her brothers and sisters are crammed into a tiny apartment in a bad area of Delhi, denied the chance to live somewhere better by their ethnic origins (they come from North East near the Chinese border and are taunted by locals as ‘Chinkies’. It’s a hard life – two hours of commuting each way, long hours, good tips, but the money’s soon eaten up by the relatives she supports. Esther looks as if she’s living the dream but for the Beautiful and the Damned, the dream is never far from a nightmare. I read The Beautiful and the Damned voraciously, touched by the people Deb introduced us to, moved by their plight, or shocked by their deviousness, saddened by the exploitation but seldom with any doubt that the stories were entirely authentic. I would struggle to sit down and read an academic book on any of the topics covered so I’m grateful to Deb for making this an easy – though often uncomfortable – read. I knew many of the areas he visited and finished the book feeling that my next visit to India will be enriched by what I learned by reading The Beautiful and the Damned. 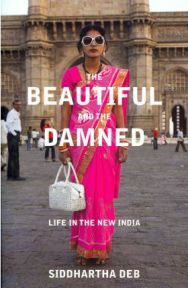 No Comments on "The Beautiful and the Damned: Life in the New India"